Working with the Admission Office has been such a phenomenal experience—hearing the stories of those who will continue the Tribe legacy, spending quality time with 11 of the coolest interns and rising seniors on the planet, and getting to talk about why William and Mary is my favorite place in the world (while walking backward!) and having people who want to listen. William and Mary is not the most handicap-accessible campus in the world. In fact, it is probably one of the four things in the world that it is not in the Top 10 for. If I were to list my six least favorite things in the world, they would be: Lebron James, the Miami Heat, Pepsi products, mirrors that zoom in too much, lima beans, directions, and counting. Not necessarily in that order. The only important thing on that list being the one that is bold and italicized. I will save my vendetta on the ID Office for a later date, but know that I could spend $20 on a new ID card and have all those frustrations wiped away. Rather, I choose to evoke my intense stubbornness (I tell you, I get it from my dad’s side of the family) and continue my college life with a barely-functioning ID. William and Mary loves its students. And as part of that love, they always try to make our campus better. And as part of making our campus better, there is ALWAYS construction. Okay. I think you are now ready to encounter… The Worst Tour in History. It is Monday morning, and I am scheduled to give a tour. It has been a solid week and a half since I had last given a tour, so I was excited. Born ready to stretch those calf muscles and amplify those vocal cords. As we were about to go into the session room and introduce ourselves, we learned that one of us would have to give what is called a “No Steps Tour.” The “No Steps Tour,” for my readers without deductive abilities, is the tour we give for our handicapped visitors… and it has no steps. What it does have is its fair share of uneven bricks, elevators, and trekking down Jamestown Road. Now, I had given a “No Steps Tour” before, and it went rather swimmingly. Due to such a positive (and swimming) experience, I decided to take upon the opportunity to give another. Poor decision #1. Up to the front of the room I went, and I introduced myself – “Hulllllllllo and good morning! 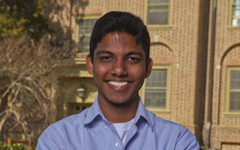 My name is Karthik, and I am a rising senior here at the College. I am a marketing major from Richmond, VA, and I will be giving the No Steps Tour today!” Solid intro. Looks like I’m off to a good start. The tour guides split up the room (we are enthusiastic people who love the College… not math majors or statisticians. Which is to say, we aren’t too talented at the whole splitting groups up thing, resulting in groups ranging anywhere from 15-40), and since I have the No Steps Tour, I take the smallest group of about 20 people. We grab our ice-cold water bottles, and we’re about to be off! I get a quick reminder from one of the other tour guides, “Remember to go in the Chandler-side of Barrett ‘cuz that’s where the elevator is.” Gottumz. Walking down Jamestown Road, I begin my tour guide schpiel. I talk about all the great things the College is able to offer and the fact that we have an Ancient Campus, Old Campus, and New Campus (“Yes, we are old enough to have an Ancient Campus). I suppose it would be more accurate to say, I tried to talk about all the great things the College is able to offer and the fact that we have an Ancient Campus, Old Campus, and New Campus (“Yes, we are old enough to have an Ancient Campus). CONSTRUCTION GALORE. Buzzsaws and tractors and drills and ladders falling and construction workers screaming and sawdust everywhere and an inordinate amount of whirring. Mixed in with the tiniest bit of exaggeration. When I realized how futile my talking was becoming, I made like the opposite of a computer and shut up. Now, the walk from the Admission Office to Barrett Hall on Jamestown Road is not excessively long—maybe four or five minutes. However, that walk in silence ON AN ADMISSION TOUR? Poor decision #2. So we finally cross the street (I missed the ramp, so the wheelchair had to do the hop-the-sidewalk move – Poor decision #3) and get to Barrett Hall. Whew. I swipe my ID card to get in, and… no dice. I try again. Still, no. Man, how I wish the ID Office lady were there at that very moment to tell me my magnetic strip was still in tact. I tried a couple dozen times, all the while trying (and failing) to make jokes, to the un-amusement of my tour group. Poor decision #4. Thankfully, at the moment I was about to give up, a fellow tour guide had walked by, and I was able to snag his ID card to get in real quickly. YES! Successful entry to Barrett! …Only to realize… I was most certainly not on the Chandler-side of the building. So my “No Steps Tour” had become the “Definitely Had Some Steps Tour.” Poor decision #5. Luckily, I have an undeclared major in “going with the flow,” so I adapted quite quickly. We went around, went through Barrett, and escaped sans a scratch. But the damage had been done. I had lost my mojo, the group had lost its enthusiasm, and I was just ready to be dunzo. Something about 118 degree weather, my inability to take simple directions around a campus I’ve lived on for the past three years, and my lack of understanding with regards to what “No Steps” means doesn’t make for the best tour. Who would’ve thunk it?